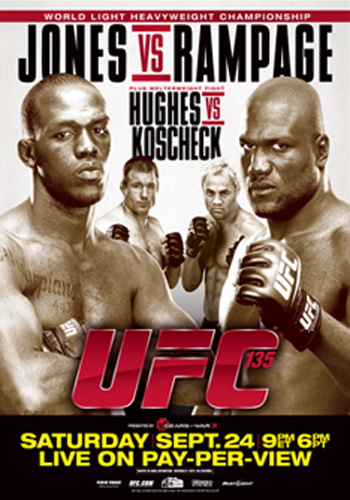 With a simple cut of Diego Sanchez’s image and a quick paste of Josh Koscheck’s picture, the official event poster for “UFC 135: Jones vs. Rampage” is once again intact. The Octagon’s highly-anticipated return to Colorado still features a light heavyweight title tilt between champ Jon Jones and Quinton “Rampage” Jackson, as evident by the billboard above. The show’s new co-main attraction now features a welterweight scrap between former title holder Matt Hughes and Kosheck. Although there are exactly nine days remaining until showtime, only 10 bouts have been confirmed for the card thus far. The Pepsi Center in Denver will host the show. The pay-per-view broadcast begins live at 9PM ET/6PM PT.